In other words, he’s hinting he can roll back time while being impervious to it. And you thought the reverse-pivot scramble was his slickest maneuver. Time, of course, is just about everything, because for 90 percent of the pro sports world, there’s very little of it at the top. Approaching his fifth NFL season, Wilson’s ability to flawlessly ambulate — he’s never missed a practice, much less a game — as well as percolate, is a remarkable feat. Wilson was a starter from day one, a Super Bowl champion at the end of year two and has won a playoff game every season. And he’s 27. Add another 15 years, and he’ll be a year older than when Brett Favre played his last. Health and desire permitting, Wilson by then should hold most of Favre’s career records. To hear coach Pete Carroll tell it, Wilson described the long-term endurance when he first walked through the Seahawks’ door. “He said (20 years-plus) the day he got here — he did,” Carroll said. Then the coach dug into an extended explanation of his belief that this fall is when Wilson goes Ph.D on the rest of the NFL. “I’m kind of happy to talk about it because you guys have asked me, ‘When’s he going to arrive?’ or ‘How long is it going to take?’” Carroll said. “I kept telling you, ‘It’s going to be down the road.’ It takes four, five, six years for these guys to develop. “He’s made a clear step ahead. His command is, like, all-time. His ability to move defenders with his eyes to set up some things – he’s consistently doing that, almost subconsciously. He’s so clued in. We saw him throw the ball all over the field throughout the off-season. He’s been strong, accurate and really precise about stuff. Carroll’s gush is neither a surprise nor an exaggeration to anyone who followed Wilson’s final seven regular-season games — 24 touchdowns and one interception, which helped him set club records for TDs (34) and yards (4,024). Considering that Tom Brady will be 39 in August, and the other veteran luminaries at his position — Drew Brees (37), Tony Romo and Carson Palmer (36), Ben Roethlisberger (34), Aaron Rodgers (32) — are at least a half-decade older, Wilson and Carolina’s Cam Newton, also 27, can be said to be the likeliest new emperors to NFL dynasties. So Wilson’s stipend this season ($18.5 million) appears to be a relative bargain. Then again, his deal is up after his age-30 year of 2019, which suddenly doesn’t seem that far off. Can you imagine the bidding war among have-not teams for Wilson’s free-agent services? OK, we’re getting ahead of ourselves. But hey, he brought up his longevity. Wilson and Newton also share a factor over which they have no control but is essential to their career numbers — the quality of their teams’ defenses. Wilson’s first four years coincided with the Seahawks defense’s four-year streak of giving up the fewest points in the NFL, a run unprecedented in the free-agent era. 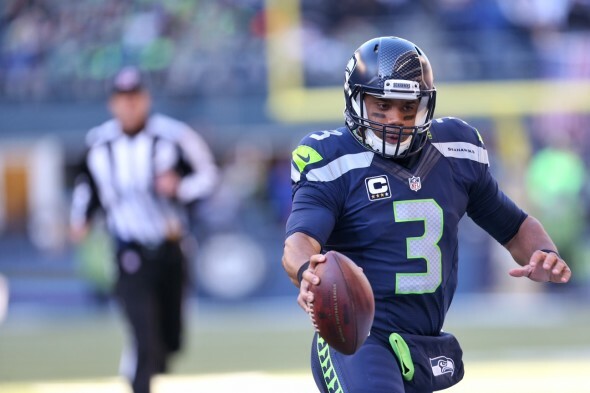 The great virtue for Wilson is that the Seahawks almost never fall behind big, allowing the offense to use conservatively the breadth of the playbook without the desperation that leads to turnovers. The only real outlier in four years was the final game of last season, when they fell behind 31-0 to the great defense belonging to Carolina. And the Seahawks still managed to make it a seven-point loss, even if the some of the Panthers checked out at halftime. If I were to guess at a non-monetary reason that would cause Wilson to depart Seattle, it wouldn’t be the potential absence of Carroll as coach. Wilson can play for any quality coach. The reason would be a defense that regressed to the mean. As in average, not anger. The Seahawks defense makes all things possible on offense and special teams. That’s why Carroll insists on spending the majority of club resources on that side. To do otherwise invites errors. The Seahawks have been a top-tier club because a relentless defense and a ruthless running back were regularly the best during four years when the quarterback was speeding through childhood, adolescence and young adulthood. The running back retired, the defense is a bit older and slower. But the quarterback is, as Carroll put it, a real true vet — and he still has his athletic legs. And for the first time in his head coaching career, Carroll has a QB for a fifth year. It couldn’t have happened at USC, and he didn’t last long enough in his two earlier NFL head coaching jobs. The possibilities of a coach in his prime and a QB in his prime (who feels 18) suggests for this fall sparks of unusual size. Another good piece, Art. I only hope your crystal ball is right on. Thanks. Wilson has the keys to the car. Foot to the floorboard. Well Art, gotta ask. Was he holding a bottle of Nano-Water or whatever that stuff is called? I hope this wasn’t some elaborate guerilla marketing ploy. Recovery Water didn’t come up. My guess is most Seahawks fans don’t care what the snake oil is, as long as it works. It will sure be interesting to follow the Newton v. Wilson development. The QB who channels all his talent through his size, versus the QB who channels all his talent around his size and through guile, grit, and hard work. Maybe the Magic-Bird rivalry the NFL never had.